Join us for a high energy party as we revisit the days of the British Invasion, Motown, California Surfin’ & the Age of Aquarius with over 100 songs, 100 costume changes, a special tribute to our veterans and yes - we’ve even added some classic 50’s tunes! The Duttons are high-energy entertainers loaded with musical talent. The Duttons are high-energy entertainers loaded with musical talent. With thirty-one years of experience, and just about as many kids between them, they rock the stage with a variety of genres. From Bluegrass to Contemporary Rock to Country, comedy and dance, essentially, they do it all. From international touring to appearances on NBC's hit television series "America's Got Talent," The Duttons are no strangers to the world of entertainment. 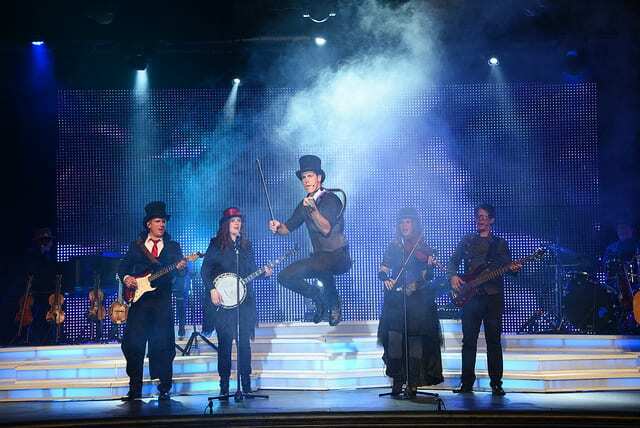 The Branson stage has been recently updated with new sound and light and a wraparound LED backdrop that serves to enhance their already amazing musical skills. Said Simon Cowell of their performance, "I loved it! I absolutely loved it!" Be sure to also watch out for The Duttons on their weekly TV series "The Duttons Through the Years" on RFD-TV! Remember now, if you haven't seen The Duttons, you haven't been to Branson! Call 888-388-8661 today!